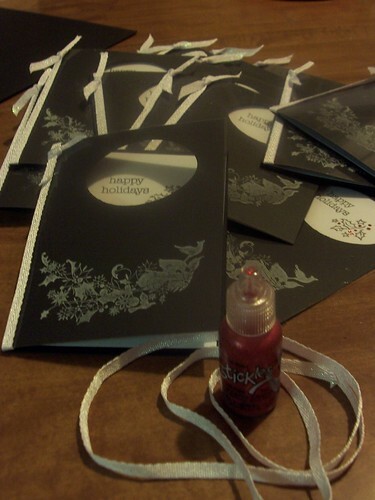 I had an order for 20 non-Christmas, winter-like, minimalist style cards. I pulled out the winter bird set from Inkadinkado and tracked down a happy holidays stamp from a hero arts set. It's hard to see in the picture but I stamped the bird in white stazon on a transparency. The black card base has a punched oval with the sentiment and a holly branch peaking out. The branch has been traced with silver glitter pen and the holly berries are stickles. 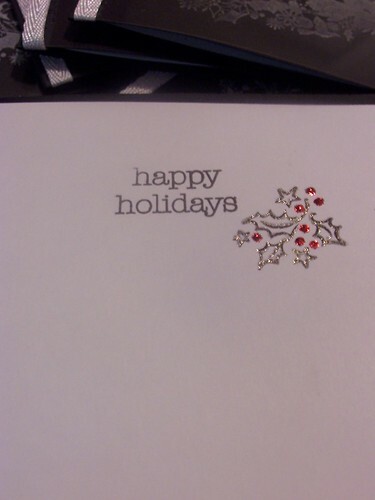 I finished the card with some sparkly twill. I'm actually pretty impressed with how long these took me. After designing the original card the actually work time (excluding drying time for the stickles) was just over an hour for 20 cards.